Transforming a house into a home is an art. The ultimate way to tackle this task is through DIY because it allows you to create an extremely personalized accent to your space. Depending on your preference, you can add an accent to show off your favorite colors, patterns, or images. Wanting a low-key classic look? With DIY, that’s no problem. Coasters are a must-have accessory for your home, but often aren’t given a second thought when it comes to decor. Customizing coasters is the perfect way to add flare to your home while still protecting your counters and tables. Coasters are double-duty necessities at home, but that doesn’t mean they can’t look stylish. 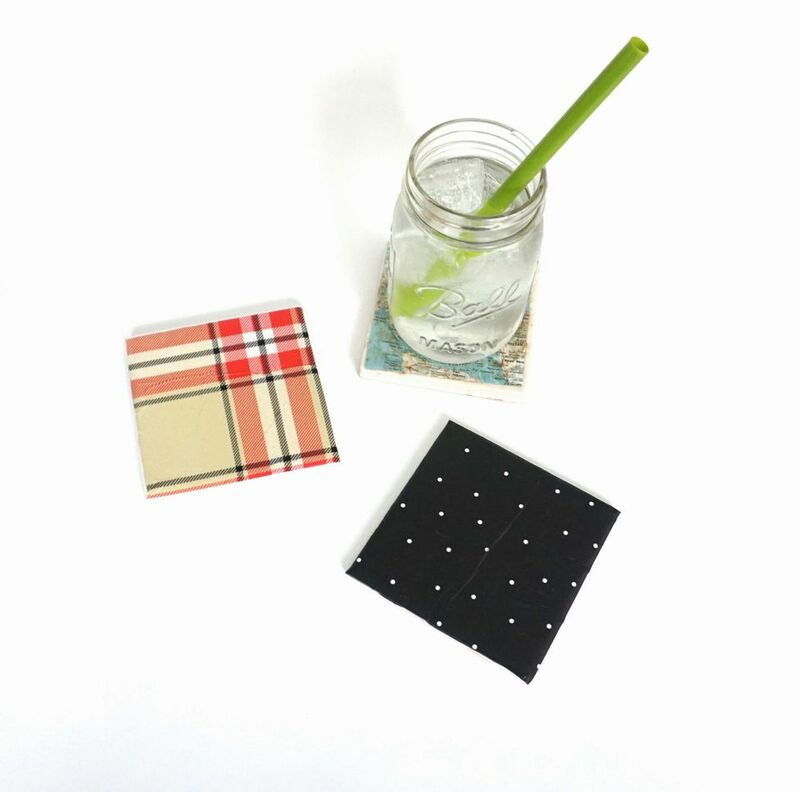 Ceramic tiles can be upgraded into personalized coasters using tissue paper, photos, or any other decorative paper using decoupage techniques. Inexpensive ceramic tiles can be found at almost any hardware store and you can pick up the rest of the supplies for this project at the craft store. These DIY ceramic tile coasters are a budget-friendly way to add a creative boost to your space. In this project, you’ll be decoupaging a square of decorative tissue paper onto a square tile. In order to do that, you’ll need to cut your tissue paper into a square the same size as your tile. Not all tiles are the same size, so you’ll want to either trace or measure your square to get the perfect fit. You can use other types of thin paper, like old maps or drawings, instead of tissue paper. Use your paint brush to spread a decoupage medium, like Mod Podge, in an even coat along the surface of your tile. This will create a sticky surface to securely place your tissue paper. After you dip your brush in the decoupage medium, a few quick swipes should be enough to coat the tile. A thin coat is best, as a thick or globby one will create an uneven surface and cause delayed drying time. Once you have coated your tile with decoupage medium, you’re ready to put your tissue paper into place. Try to prepare it for perfect placement before securing it onto the sticky surface—the paper can easily tear when moved around once it’s stuck onto the tile. Add another thin layer of decoupage medium over top of the tissue paper after you’ve placed it to get your desired finish. Make sure to carefully select a matte or glossy finish depending on your preference. You can add a finish or sealant at this point, too, if you have one. That’s a completely optional step that may give your DIY a longer life. After adding the final layer of decoupage medium or sealant, allow your tile to dry for at least an hour before moving on. This will prevent any tearing of the tissue paper or other mess in the future. Adhesive cork circles can be found at most craft stores, but felt circles or sheets can be used instead if needed. You’ll need a small cork circle at each of the four corners on your tile’s underside to create an even surface. You can also cut a sheet of cork into four small pieces or use a large piece of cork to cover the underside of the coaster rather than using pre-cut circles. The cork underneath your tile prevents scratching of your counter or coffee table and creates a more even surface to rest cups on. Plus, it adds a polished look to your project. The great part about this DIY project is that you can make as many or as few coasters as you need. You can choose to make them match or complement each other with different colors and patterns. You can even make new ones for every season or holiday. Coasters always make great housewarming or hostess gifts, too, and adding your own personal touch makes them even more special. Customize them with personal family photos or print your own paper with your favorite quotes. Personalize them further by drawing your own design onto the paper before decoupaging.